GCA (Government College Ajmer) announced the result of BSTC entrance exam. Total 2,55,821students appeared in the entrance and 13,234 students selected among these there are 5,762 girls and 7,472 boys are there. BSTC (Sanskrit) and NTT merit will be declared after BSTC counselling. Manphool Dhaka of Mandawa (Jhunjhunu District) topped the entrance by securing 570/600. 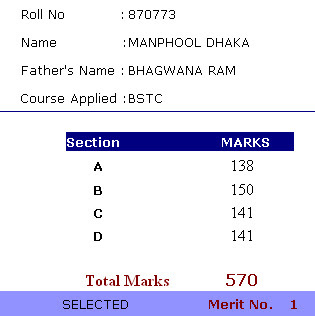 BSTC Result by Roll No.